In a city home to some of the most beautiful churches in the world, St Peter’s Basilica stands out as the most spectacular. Containing some of Italy’s most celebrated masterpieces, the basilica is one of the greatest examples of renaissance architecture in Rome and truly is a sight to behold. 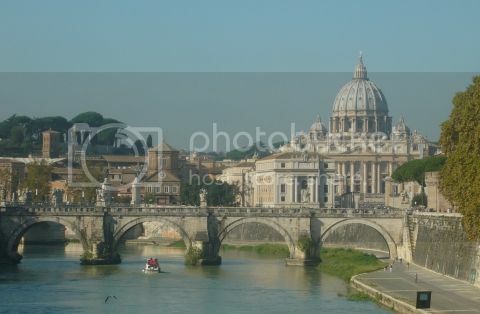 St Peter’s was originally founded by Emperor Constantine in AD 324. It was then rebuilt in the 16th century by renaissance masters including Michelangelo, Donato Bramante, Gian Lorenzo Bernini and Carlo Maderno. While not a cathedral, as it is not the seat of a bishop, it is one of the four churches in Rome that are part of the Vatican. The basilica is built on the burial site of Saint Peter, the apostle who was considered the first pope, and it is here where he died a martyr and was buried in AD 64. It is believed that Saint Peter’s tomb lies directly under the main alter and other popes are buried here too. One of the holiest sites in Christendom, the sumptuously decorated basilica draws catholic worshipers and tourists from all over the world. 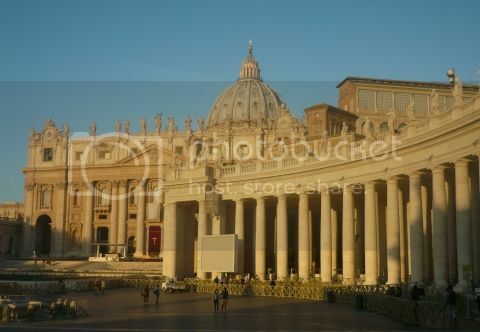 Providing the approach to the basilica is St Peter’s Square, which was designed by Bernini. It is here that the Pope blesses crowds of up to 80,000 from his balcony above the square on Sundays and religious occasions. It is one of four churches in Rome that hold the rank of major basilica and it took more than a century to build. In the square there are two fountains, designed by Carlo and Bernini while in the centre there is a huge 25.5 metre tall obelisk, dating from 13th century BC Egypt which was brought to Rome in the 1st century to stand in Nero's Circus. The square is bordered by two semi-circular colonnades, which according to Bernini symbolise the motherly arms of the church. The colonnades consist of 284 Doric columns arranged in four rows and on top of them are statues of 140 saints. Crafted by various sculptors between the 1660s and early 1700s, the statues include Christian figures such as Saint Paul and Saint John, as well as lesser known martyrs, hermits and bishops like Saint Malchus and Saint Felician. The dome of the basilica was designed by Michelangelo, who became chief architect in 1546, although he died in 1547 before its completion. Giacomo della Porta and Domenico Fontana took over the direction of the work, completing it in 1590. It is made of brick and is 42.3 metres in diameter, rising to 136.6 metres above the floor. The grand façade of St Peter’s Basilica was designed by Carlo Maderno and is 115 metres wide and 45.5 metres high. The façade is built of travertine stone and on top of it are 13 statues, which include Christ flanked by 11 of the apostles and John the Baptist. In the middle of the façade is the central balcony. Known as the Loggia of the Blessings, it is from here a newly-elected Pope gives their first blessing. Five doors lead into the narthex, or entrance hall. Once inside, the sheer scale of the St Peter’s becomes apparent. The basilica’s interior is 187 metres long, containing 11 chapels and 45 altars. The inside is lavishly decorated and home to many examples of Renaissance and Baroque art, with much of the elaborate decoration owed to Bernini’s mid 17th century work. The opulence of the décor bears testimony to the wealth of the Catholic Church when the basilica was built in the 16th century. 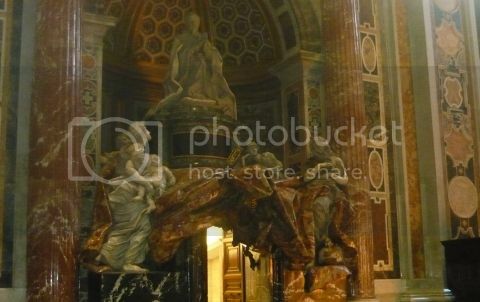 Just inside the entrance is Michelangelo’s Pietà, one of the most famous sculptures in the world. Made of marble, it is a statue of Mary holding the dead body of Jesus and was created in 1499-1500 when Michelangelo was only twenty-five. Most striking of all is the Baldacchino by Bernini, a huge baroque canopy which dominates the nave. Supported by four spiral columns, it is made of bronze taken from the Pantheon. Commissioned by Pope Urban VIII in 1624, it stands over the Papal Alter, at which only the Pope can take mass. Above it is Michelangelo’s enormous dome. The inside has images painted on it of Jesus, Mary, saints, angels and on the top, God the Father. To the right of the altar is a bronze statue of St Peter, believed to be a 13th-century work by Arnolfo di Cambio. Surrounding the Baldacchino are four pillars supporting the dome and in the base of them are niches containing statues of St. Veronica, St. Helena, St. Longinus and St. Andrew. 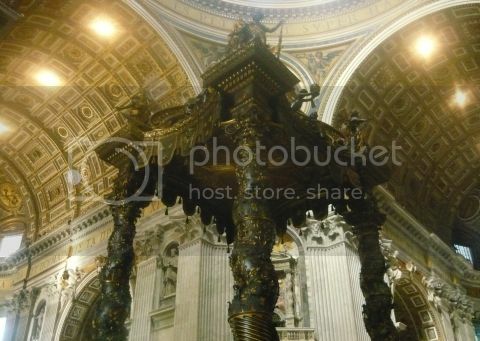 Located in the apse of the basilica is the Chair of St Peter, also known as the Throne of Saint Peter, enclosed in a sculpted gilt bronze casing designed by Bernini. The window above it lights an image of the Holy Spirit, shown as a dove radiating out rays of sunlight amid the clouds, helping to emphasise the chair's symbolic significance. Next to the apse is the tomb of Pope Urban VIII, which was also created by Bernini. On the left beneath the aisle arch is a Alessandro Algardi’s monument to Leo XI, whose reign as pope lasted only 27 days. In an alcove on the left of the transept is Bernini’s last work, the Monument to Pope Alexander VII. Completed in 1678, the sculpture is of the pope sitting among the figures of Truth, Justice, Charity and Prudence. It depicts the pope praying in front of a gilded bronze representation of Death　holding an hour-glass, reminding us that our time here on Earth is all but fleeting. The statue representing Truth has her foot resting on a globe, specifically placed upon the British Isles, symbolising the pope's problems with the Church of England. The Forum was the centre of political and public life in Imperial Rome; a grandiose district of temples and monuments epitomising the decadence of the Roman Empire. 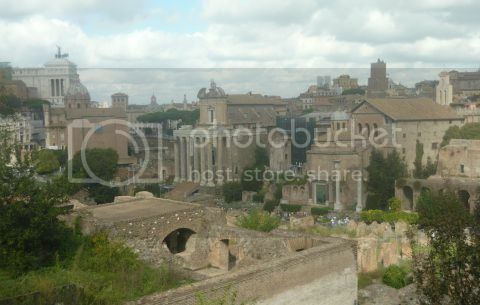 Situated in a valley between the Palatine and Capitol hills, the Forum today is a sprawling mass of ruins. Jumbled blocks of ancient marble lie strewn across the site. Temples where the rich and powerful of Rome’s elite once congregated have decayed and crumbled. The Forum was built on inhospitable marshland and first developed in the 7th century BC. Beginning as a market place, during its peak the Forum was the economic, political, and religious centre of Rome and a majority of the structures were built during the reign of Julius Caesar and his successor Augustus. Its importance declined in the 4th century AD and as time passed it was abandoned. During the Middle Ages it became a pasture for sheep and cattle, which gave it the nickname "Campo Vaccino" – "the cattle field". Excavations began in the 18th century, but it was not until the early 20th century that the area was excavated fully. Entering from the east, you first pass the Arch of Titus. Erected in AD 81 by the Emperor Domitian in honour of the victories of his brother, Titus and his father, Vespasian, in Jerusalem in AD 70. The eastern side of the Forum is dominated by the ruins of the Basilica of Maxentius and Constantine, the largest building of the Forum. Construction of the basilica was started by Emperor Maxentius in AD 308. Following his defeat by Constantine during the battle at the Milvian Bridge in AD 312, the basilica was completed by the new regime in AD 315. The basilica measured 100 metres by 65 metres and was 35 metres high. The building consisted of a large central nave covered by three concrete barrel vaults, which were used as law courts. It also contained a colossal 12 metre tall statue of Constantine, parts of which can now be found at the courtyard of the Palazzo dei Conservatori, part of the Capitoline Museums. Further along the Via Sacra, which was once the main street, is the Temple of Romulus, a domed building from the 4th century. One of its most striking features is its green bronze door, which at around 1700 years old has survived numerous disasters and the sacking of Rome by the Visigoths. It was probably dedicated Romulus, the son of emperor Maxentius, and was converted to a Christian church in the middle ages. Next to it is the Temple of Antoninus and Faustina, built by emperor Antoninus Pius in honour of his late wife Faustina in AD 141. On the emperor’s death, the temple was then rededicated to the two of them. In the 11th century it was converted to a Roman Catholic church known as San Lorenzo in Miranda, as it was believed that St Lawrence had been sentenced to death here. 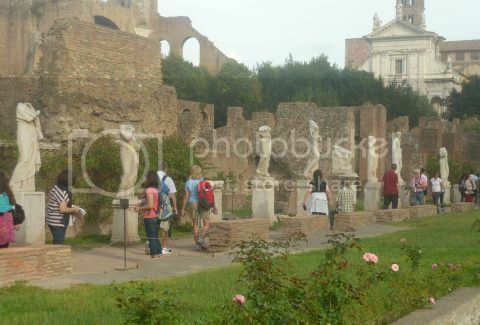 On the south side of the Via Sacra is the Temple of Vesta. One of the most elegant temples in the Forum and also one of the oldest in Rome, it has been rebuilt many times and today’s ruins date from AD 191. It was here that the fire sacred to Vesta, the goddess of the household hearth, had to be kept perennially burning, the responsibility of which was given to six Vestal Virgins. As soon as a girl became a Vestal, she would live in the House of the Vestal Virgins. Once an enormous complex with around 50 rooms, all that remains now are a few rooms around a courtyard. Overlooking a pond, are weathered statues, many of which are now headless, dating from the 3rd and 4th centuries. The Vestals were the only group of women priests in Rome and keeping the flame alight was no easy task. If any one of them allowed it to go out they would be flogged by the high priest and then dismissed. The cult of Vesta is one of the oldest in Rome. Chosen between the ages of six and ten-years-old from patrician families, they were required to stay in the order for 30 years, respecting a vow of chastity. The penalty for ignoring this was to be buried alive, while the penalty for the offender was to be flogged to death. When Vestals retired they were allowed to live their life as they wished and even marry, although few ever did. At the north west end of the Forum is the 23 metre tall Arch of Septimius Severus. It was dedicated in AD 203 to commemorate the victories of Emperor Septimius Severus and his two sons, Caracalla and Geta, against the Parthiana in AD 195 and AD 199. After the death of their father, Caracalla and Geta were initially joint emperors. However, Caracalla had Geta assassinated in AD 212 and all images and mention of Geta on public buildings and monuments were removed, including the arch. Next to it is the Temple of Saturn, the eight surviving columns of which stand next to the three columns of the Temple of Vespasian. One of the most prominent ruins in the whole Forum, the Temple of Saturn was originally erected in 497 BC and was completely rebuilt in 42 BC. It was also the site of the Republican Roman treasury. Titus began building of the Temple of Vespasian in AD 79 following his succession after the death of his father Vespasian. After Titus died, his brother Domitian completed the temple and dedicated it to Titus and Vespasian in AD 87. Just in front of this is the Rostrum, a public speaker's platform, originally built in the fourth century BC and is famous for being the place where Shakespeare had Mark Anthony make his "friends, Romans, countrymen…" speech. In front of this sitting in the main square is the Column of Phocas, which is one of the last monuments to be erected in the Forum in AD 608. Located at the edge of the main square of the Forum are the remains of the Basilica Jiulia, which was begun by Julius Caesar and finished by Augustus. 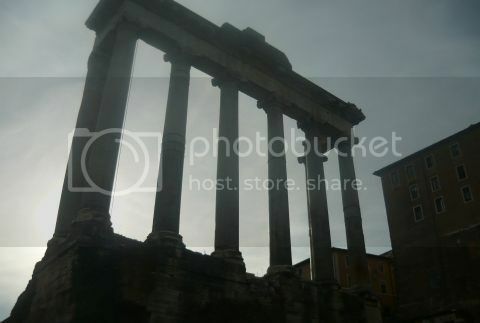 At the end of the basilica are the three Corinthian columns of the Temple of Castor and Pollux. Having stood the test of time for nearly 2000 years, Rome’s Colloseum is the most spectacular of the city’s ancient sites. Eliptical in shape, it was originally known as the Flavian Amphitheatre and was commissioned around AD 70-72 by Emperor Vespasian as a gift to the Roman people. However, before its completion, Vespasian died, and it was his eldest son, Titus, who officially opened the Colosseum in AD 80 with 100 days of festivities, including gladiatorial combat and public feasts to mark the inauguration. It was eventually completed in the reign of his other son, Domitian. 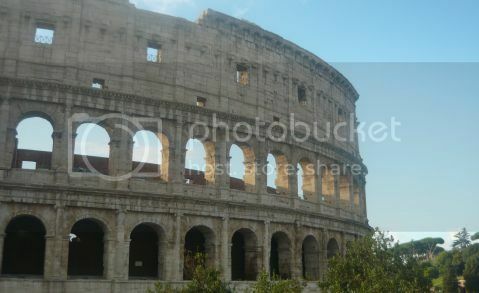 At the time, it was the largest structure in Rome. It measures 189 metres in length by 156 metres wide. The height of the outer wall is 48 metres, while the perimeter originally measured 545 metres. Walking around this amphitheatre of death, where slaves and gladiators fought for their very lives against all odds, it is easy to imagine the brutality of what once went on here. The different events included battles between gladiators, also known as the munera, and hunts for wild animals. Gladitorial combat took the form of a duel between two fighters, generally until the death of one or the other. Venationes in ancient Rome involved condemned criminals fighting wild animals for the entertainment of the baying crowd or animals pitted against each other. They were immensely popular and included lions, bears, bulls, panthers wild goats and dogs. Thousands of animals could be slaughtered in a day and over 9,000 were killed in the inauguration of the Colosseum. Popularised in the film Gladiator, representations of venationes can be seen on coins, mosaics, and tombs of the period. The central arena is an oval measuring 76 by 44 metres, surrounded by a wall 5 metres high. The public found their way to the auditorium through the 76 entrance gate arches, while the Emperor and the upper classes used the four special un-numbered gates, known as the Grand Entrances. The five sections of the auditorium, from bottom to top, would have accommodated around 50,000 spectators who were seated according to their gender and social status. On the lower levels were the more prominent citizens and nobility; while on the upper levels were the lower classes and women. The first tier was known as the podium. Providing the best views of the arena, the seats here were reserved for the higher echelons of Roman society, including the emperor and royal family, nobles, senators, visiting dignitaries and religious figures. 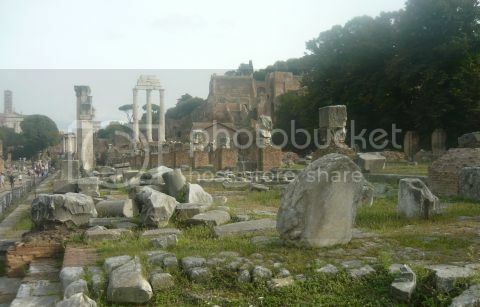 The emperor took up position located on the podium at the centre of the narrower side of the arena on the north side. Today there is a cross where the emperors would have sat. The floor of the arena was made with wooden planks and covered with yellow sand, sometimes dyed red to hide the blood during the shows. Little remains of the original arena floor now. 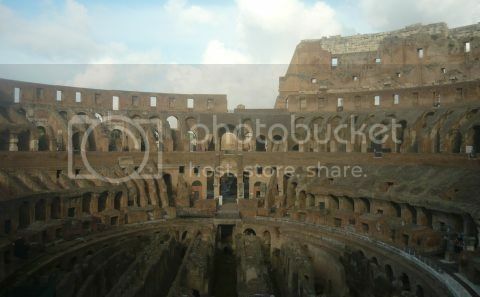 Underneath the Colosseum is the hypogeum, a labyrinth of underground passages. It consisted of two-level subterranean network of tunnels and 32 animal pens, providing instant access to the arena for animals and gladiators. The Colosseum remained in service for 450 years and now all that is left is the skeleton. Nearly two-thirds of the original building has been destroyed by fires, earthquakes or theft. The southern side fell during an earthquake in 847, while material from it has also been used in monuments such as St. Peter’s Basilica. As a result of opposition due to the growth of Christianity, gladiatorial games began to disappear from public life during the third century. 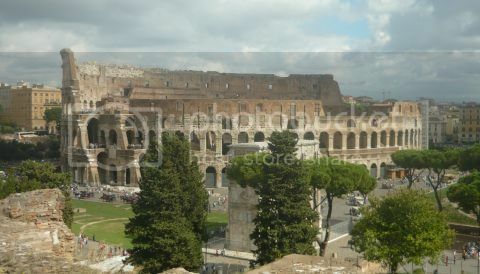 Stone was looted from the Colosseum and it was even leased out by Pope Alexander VI as a quarry. In 1749 that Pope Benedict XIV forbade the removal of stone from the structure and erected a cross in remembrance of the Christians who had been martyred there. However, there is no historical evidence to support Benedict’s claim. Today, the Colosseum is one of Rome’s most popular tourist attractions, with millions of visitors flocking there every year. In recent years, it has become a symbol against the death penalty, which was abolished in Italy in 1948. Since 2000, following a number of demonstrations against capital punishment, the local authorities of Rome have changed the colour of the Colosseum's night time illumination from white to gold whenever someone condemned to the death penalty anywhere in the world has their sentence commuted or is released. Unbelievably, I'm finally packed and ready to go. 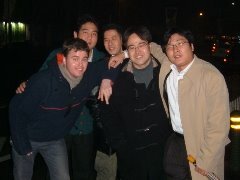 I've had a wonderful time in South Korea and it has been better in more ways than I could have ever imagined. From the delights of traditional Korean cuisine in Jeonju, to the last remnants of the Cold War in the Demilitarised Zone, South Korea has proved to be a remarkably fascinating country that I have enjoyed enormously. As always when travelling it wasn't just the places I visited, but the people I met along the way that made it all so special. 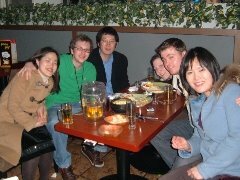 Over the past few weeks it seems as if I have been endlessly saying goodbye to people and nearly every night has been a leaving party. Only now, just before I catch my coach to the airport, does it feel as if it is beginning to sink in. When travelling, bidding adieu to everyone you have met is always tinged with sadness, especially when you know that you might not see them again. As I get older it unfortunately doesn't seem to get any easier. I'm returning to Britain for a short time to teach and hopefully in a few months time I'll be on my way around the world once again. You can all of the photos here. I first visited the Demilitarised Zone(DMZ) last September and on Saturday I returned, to find out more about the events that have shaped the Korean peninsula since it was first divided in two, following the Second World War. Like a bizarre Cold War theme park, there are a number of tours you can take in the DMZ and one of the most popular ones is the Panmunjoem tour. During the Korean War, the village of Panmunjeom was at the centre of all peace negotiations from 1951 to 1953. It was here that the final armistice was signed on July 29, 1953, resulting in the creation of the DMZ, along the 38th Parallel. After the signing of the Armistice Agreement, a new site was constructed approximately 1km south of Panmunjeom for further peace negotiations to take place in. 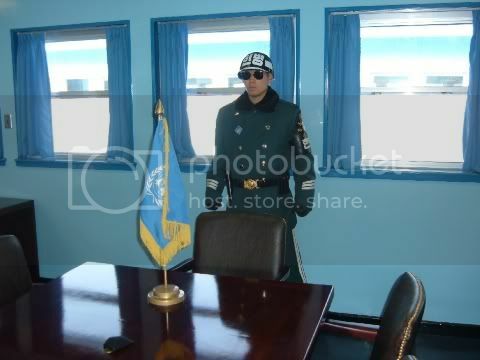 Although the new site is often referred to as Panmunjeom, it is officially known as the Joint Security Area(JSA), an 800 metre square area of land that is policed by the United Nations and North Korea. After boarding the coach in Seoul, we travelled north towards the Demilitarised Zone along the Freedom Highway. The Han River beside it was frozen and a layer of snow covered the landscape. Once again we passed through security checkpoints and the passports of everyone on the tour were checked by South Korean soldiers. We then headed to Camp Bonifas, the base camp for the United Nations Joint Security Force, at the southern entrance to the DMZ. After changing coaches, we then went to the Ballinger Hall, for a briefing on the history of the area. Once inside we were asked to sign a declaration form relieving the United Nations of any responsibility should anything happen. The slide show at the briefing proved to be extremely informative, giving a detailed account of the history of the DMZ and events that have occurred there.Home to 500 South Korean and US troops, Camp Bonifas was originally called Camp Kitty Hawk and was renamed in 1986 in honour of Captain Arthur G. Bonifas. On August 18, 1976, a South Korean work party supervised by a United Nations Command(UNC) security force was attacked by a group of North Korean soldiers. There to prune a tree obscuring visiblity between two outposts near the Bridge of No Return, what ensued has become commonly known as 'The Axe Murder Incident' and is one of the most tragic events to have occurred in the DMZ since its inception in 1953. When confronted by the North Korean soldiers, the 5 members of the work detail fled, leaving behind 14 UNC personnel. Outnumbered by the 30 Korean People's Army(KPA) soldiers, during the fight the Joint Security Force Commander, Capt. Arthur G. Bonifas and First Lieutenant Mark T. Barrett, were both killed by the KPA soldiers who used their own pikes and clubs, as well as axes left behind by the work detail. After the briefing we got back onto the coach and then headed towards Panmunjeom. On the way our guide pointed out 'the world's most dangerous golf course'. Located at Camp Bonifas, the one hole, par 3 course, was once surrounded by landmines on three sides and was famously featured in Sports Illustrated Magazine. We then drove past anti-tank walls and through a gap in a minefield that stretches across the whole country. About seven metres wide, with huge, razor-sharp barbed wire fences on either side, the minefield provides one of the biggest disincentives for anyone wishing to enter South Korea illegally from the North. Along the base of each fence small stones were piled up, one on top of another, the purpose of which is to detect if anyone has infilitrated South Korea. Upon arriving in Panmunjeom, we were advised not to smile or wave at the North Korean soldiers if we saw any. The reason for this was because if any photographs were taken, they could be used as a propaganda tool. For a brief moment the surreal thought of becoming a media celebrity in North Korea entered my head. We were also warned to only take photographs in the designated areas. Once off the coach we were escorted to the Military Armistice Commission(MAC) building, which is definitely one of the highlights of the tour as it allows you to actually enter North Korean territory. One of three single storey structures that are light blue with corrugated rooves, it is here that the main peace discussions take place between North and South Korea. A number of South Korean soldiers were on guard, all of them looking very serious in their dark sunglasses and standing in a taekwon-do stance, which our guide told us was to look more intimidating. 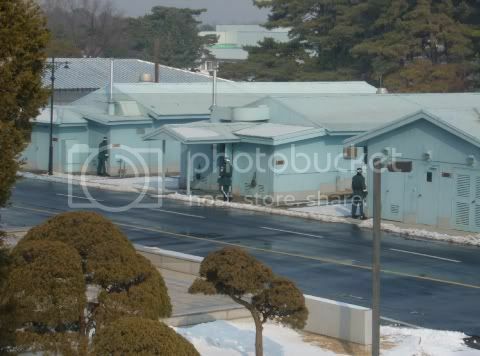 Each one of the soldiers outside only had half their body exposed to the North Korean side, so that they could easily escape if they were shot. Inside the MAC building there were two more South Korean soldiers, both in the taekwon-do stance. In the middle of the room was a table with the flags of the United Nations and North Korea on it, as well as a row microphones going down the centre of it, denoting the border between North and South Korea. One soldier stood at the end of this table, whilst the other stood guard at the far end of the building in front of a door leading to North Korea. We were advised not to walk behind the South Korean soldier guarding the door, as this would probably be seen as trying to defect. We then made our way outside to the Peace Pagoda, an observation platform to view the surrounding area. From here it was possible to see all around. On the South Korean side Freedom House and The Peace House. On the North Korean side the buildings of Panmungak and Tongil-gak as well as a guard post. After taking photographs we were once again ushered onto the coach for the final part of the tour. After a short drive we passed Checkpoint 3, where visiting presidents and defence secretaries often go when they want to gain a closer view of North Korea. The coach then stopped at an observation post from which we could see the North Korean propaganda village of Gijong, as well as the world's largest flag pole. From here it was also possible to see the Bridge of No Return, which crosses the military demarcation line. After the Armistice Agreement was signed in 1953, prisoners of war from both sides were exchanged on the bridge. It gained its name as prisoners of war who voluntarily chose to return to the North, would no longer be able to return to the South. The DMZ is one of the most interesting tourist destinations in South Korea, if not the world. Where else is it possible to visit one of the last vestiges of the Cold War and to see first hand a country which President George Bush as recently as 2002, described as being part of 'the axis of evil'? Although the risk factor in the DMZ is almost negligible, it is still a place fraught with tension. North Korea's relationship with its neighbours and America remains a frosty one and little progress has been made in recent years regarding issues such as its nuclear programme, or the abduction of Japanese citizens during the 1970s. Despite hopes that the two Koreas will one day reunite, at present there sadly appears to be little or no resolution in sight. Gyeongbokgung is by far the most famous and beautiful of all the palaces in Seoul and with a history spanning more than 500 years, it is also one of South Korea's most popular tourist attractions. 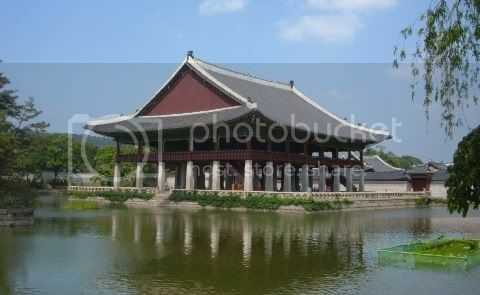 Built in 1395 by the founder of the Joseon Dynasty(1392-1910), King Taejo(r. 1392-1398), it served as the main residence for royalty, up until it was burnt down in 1592 during the Japanese invasions. It lay in ruins for 300 hundred years until it was rebuilt in 1868 by Heungseon Daewongun(1820-1898), the regent and father of King Gojong(r. 1863-1907). 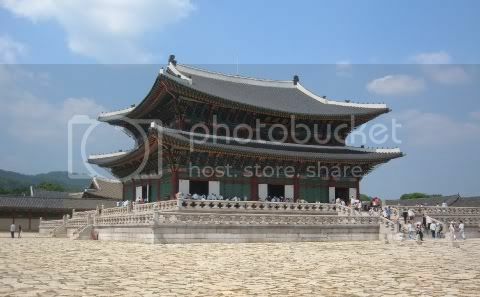 During this time Changdeokgung was used as the main palace. Under the colonial rule of the Japanese(1910-1945) many of the buildings were destroyed and the area became the site for the headquarters of the Governor General of Korea. In recent years much effort has been made to restore the palace to its former glory, a process which it is hoped will be completed by the year 2020. At the southern entrance to the palace grounds is the main gate. Known as Gwanghwamun, at various times throughout the day guard ceremonies are performed here, which really help to bring alive the pageantry of a past time. Just beyond this lies the main hall, Geunjeongjeon, where the king would have held official functions and conducted state affairs. Other buildings include the 48-columned Gyeonghoeru Pavillion, which was erected by King Taejo in the western section of the palace grounds. Built on a man made lake for festivals and entertaining guests such as foreign dignitaries, the king would also have used it for boating. 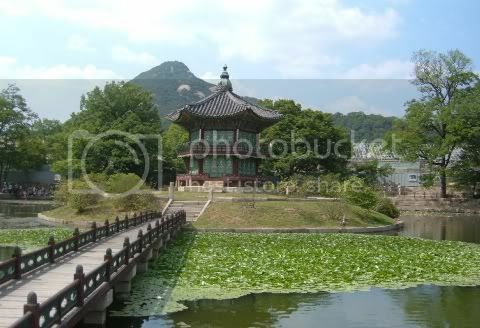 At the northernmost section of the palace grounds is the Hyangwonjeong pavillion. Built on a small isle, this two-storey hexagonal structure is situated at the centre of a beautiful lotus pond and rock garden. Despite the throngs of tourists and school parties, it's easy to imagine how the kings and queens of a bygone era would have come here to relax. Here's a short film of Gyeongbokgung Palace. 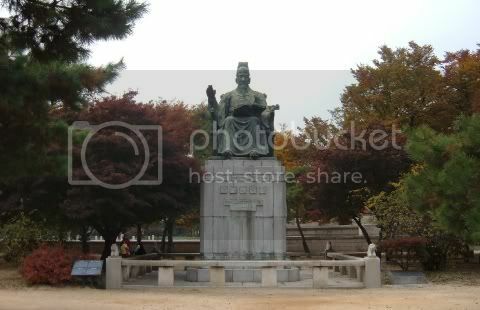 On the grounds of Deoksugung Palace proudly sits the statue of King Sejong(r. 1418-1450). Born in 1397, he is widely regarded as one of Korea's greatest kings during the Joseon Dynasty(1393-1910) and is renowned for his cultural achievements, as well as improving the welfare of the Korean people. His mastery of Confucian doctrine enabled him to successfully deal with the yangban scholars on an equal footing and he was resposible for a number of progressive ideas in administration, health, science and medicine. During his reign he brought in many reforms relating to land tax and health, to improve the living conditions of his subjects, as well as establishing the Jiphyeonjeon (The Hall of Worthies). Comprised of twenty of the foremost scholars of the time, they were able to devote their full time to study, in order to promote research in institutional traditions and politico-economics. Committed to improving the intellectual wellbeing of his people, he is probably most famous for creating the Korean Hangul alphabet. At the time of his reign, the Chinese alphabet was used to document the Korean language and with its thousands of different characters, learning it provided a difficult task. Based on a phonemic system consisting of 11 vowels and 17 consonants, it has since been reduced to 24 letters consisting of 10 vowels and 14 consonants. When introduced in 1446, there was initially some resistance from scholars as it might limit the study of Confucian texts. However, King Sejong remained firm in his belief, paving the way for improved literacy and better education amongst the population. Towards the end of his life he suffered from paralysis, which affected his motor skills and left him unable to speak. He finally died in 1450 at the age of 52, after developing cancer. 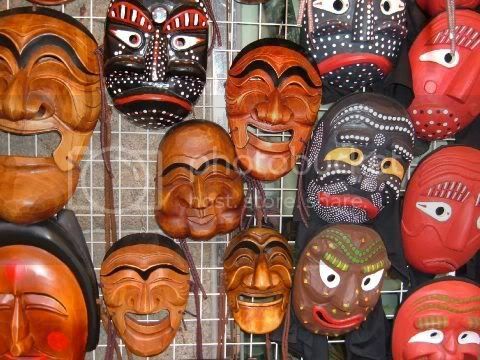 Here is a short film of Deoksugung Palace. On the slopes of Mount Hamwol, some 20 km east of Gyeongju, is the Golgulsa Temple. Famed for being the only cave temple in South Korea, it is believed to have been built in the 6th century by Buddhist monks from India. It is also provides a destination for those wishing to get away from their busy, materialistic and stressful lives, to participate in the temple stay programme that is on offer there. Temple stays were originally established for tourists during the World Cup in 2002 and their continued success has meant that the programme has now been extended. They allow people to experience first hand how Buddhist monks live and there are currently 43 temples involved in the programme throughout South Korea. The popularity of them shows no signs of waning and upwards of 30,000 people take part in them each year to experience that elusive getaway to a place a million miles from the humdrum of modern life. Having visited many temples in Thailand, Korea and Japan I've always been fascinated by Buddhism, so on Saturday I set off for the Golgulsa Temple to experience first hand the Buddhist way of life. Arriving at the temple at around four o'clock, I was then shown to my room by one of the monks. Although quite basic and sparse, mattresses and bed clothes were provided and fortunately there was Korean ondol underfloor heating, so I had no worries about feeling cold during my nights sleep. On the wall was a schedule, as well as list of rules. Most of these were related to behaviour and etiquette, such as not smoking or drinking alcohol and really just required common sense. What I did find interesting though was the punishment for being late to any of the various activities would involve having to carry out a thousand bows. At this point I decided to make sure that I arrived everywhere in good time and I also set my alarm clock, just in case I overslept for meditation at 4.30 the following morning. After unpacking I decided to explore the temple grounds. Many of the buildings are recent constructions, but are fortunately built in a traditional Korean style so they take nothing away from the atmosphere of the experience. I made my way up the hill and past the main temple hall and then climbed up onto some rocks to see the cave temple. Inside there was a statue of the Buddha against the rear of the cave with burning candles alongside it and against the sides of the cave were many more smaller images of the Buddha. As I looked inside, people visiting put their palms together and bowed in front of the main Buddha. 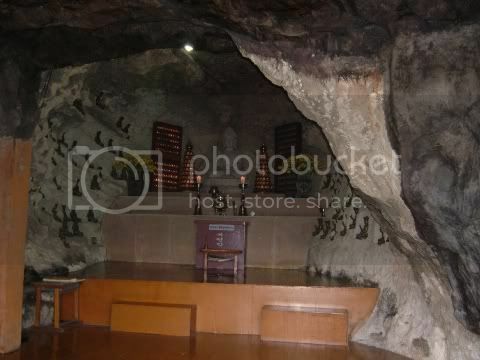 Exploring more, I came across other caves with images of the Buddha and candles burning inside them. Originally there twelve but now there are only seven. Climbing further up, above the caves was the Maya Tathagata Buddha carved on the rockface. Even though I have seen many similar images of the Buddha recently, this one was by far the most beautiful. Sadly, due to the weak nature of the rock much of the lower half of the Buddha has crumbled away, so it is now protected with a perspex cover to prevent further erosion. After dinner, I made my way I made my way to the sunmudo hall for the evenings activities. As I went in everyone was lined up in rows, so I took a cushion and sat down with them. We firstly had to do 108 bows, which is a way of repenting and it also acts as a way of removing desires and purifying the mind and body. To complete the 108 bows, you must firstly complete a full standing bow by putting both palms together(hapchang) as if to pray, whilst also keeping your feet together. You then bow fully from the hips and return to the vertical postion. This is done once at the beginning and once at the end. You then bend your knees and drop to the floor, whilst maintaining the hapchang position and then rock forward onto all fours and back. Your forehead should then be touching the floor and both hands should be upturned. This position should then be held for a brief moment and then you should rock forward to be back on all fours. After this you must sit back with both hands in hapchang and return to the upright standing position. The entire process is then repeated a further 107 times and believe me when I say it may sound very straight forward, but once you've been doing it a short time there does come a point when it starts to hurt. 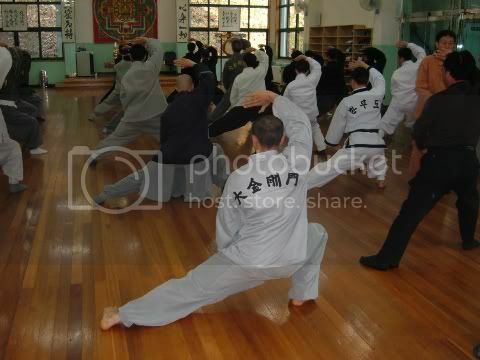 Once everyone had finished their 108 bows, it was then time for a warm up before the rigours of sunmudo training. Based on martial arts techniques handed down through the centuries from generation to generation of Buddhist monks, sunmudo is a way of harmonising the spirit to bring about an inner peace and ultimately reach spiritual enlightenment. Revived in the 1960s by the Venerable Yang-ik, these techniques were then taken by the Venerable Seol Jeog-un, who renamed them sunmudo and created the Sunmudo University at the Golgulsa Temple. Unlike other martial arts that rely more on physical strength, it focuses on breathing, meditation and body movement, to help attain a higher state of mind and in many ways the techniques used are not dissimilar to those in yoga and tai chi. After the warm up we split into two groups, those who were more experienced and those new to sunmudo and just at the temple for the weekend. We moved to the other end of the hall and sat down in front of our instructor. 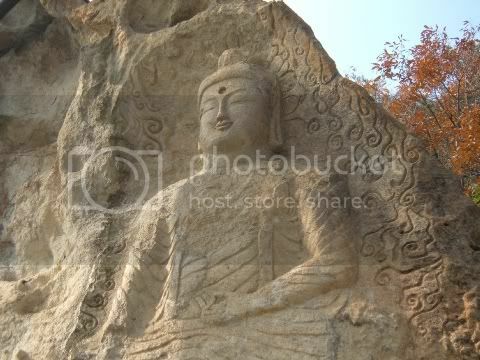 Seon Buddhism is the Korean equivalent of Japanese Zen Buddhism. Originally believed to have been founded in China by an Indian Buddhist monk called Bodhidharma , it focuses primarily on meditation as being one of the main ways of achieving enlightenment. There are two forms of meditation used Jwaseon(sitting-style) meditation and Haengseon(walking-style meditation), both of which allow a person time to reflect on life and search for their true self. Sun firstly showed us the half lotus position. Sitting down I crossed my legs, placing the sole of my left foot against the inside of my right knee. With my hands I formed a circle on my lap, the left palm covering my the fingers of my right hand and my thumbs slightly touching. He then showed us the different movements with our hands, all done very slowly, which I followed whilst breathing deeply. Once we had mastered the basics of meditation, it was time for the sunmudo training. 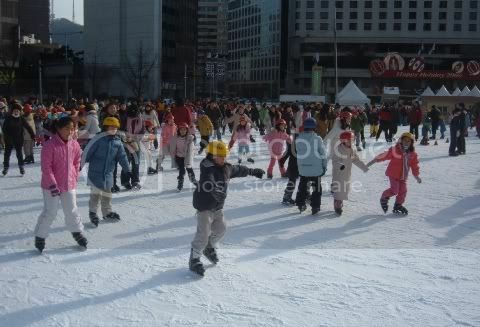 We began by firstly walking round in a circle on all fours, which was then followed by kicking as high as we could with both the left and right legs. After this we practiced some basic sunmudo moves that involved kicking and punching in the air, sometimes at the same time, which required some extremely good balancing skills. Fortunately I didn't completely embarrass myself and managed to maintain my equilibrium for much of the time. 'Very good for a first try. You will be a sunmudo master in no time', said Sun. I appreciated his comments, although I did take them with a slight pinch of salt. After the sunmudo training, we rejoined the main group and gathered round in a circle for Seon meditation. I had read in the literature before coming that apparently if you fall asleep, someone comes up to you and pokes you in the back with a stick. Fortunately I managed to avoid dozing off and thus avoided any unwanted prodding sensations in my back, despite feeling incredibly relaxed whilst doing the meditation and maybe even a little bit drowsy. Once the meditation was finished at nine thirty, we all made our way back to our rooms, whereupon it was lights off almost immediately, to make sure of a good nights sleep for the early start the next day. Just after four o'clock the next morning I was awoken by the sound by a Buddhist monk walking around the temple grounds hitting a wooden block, known as a moktak. After getting ready I made my way up towards the main hall of the temple. The ceiling of the temple was lined with pink lotus lanterns from one end of the room to the other and on the walls were pictures of various Buddhist deities. Once again we did 108 bows, which were followed the reading of Buddhist scriptures and then meditation. Then we went outside to a hill, where we formed a circle around a pagoda for walking meditation, to give us time to reflect and prepare for the coming day. In complete silence we walked around it, five metres apart in single file and then down to the Il-Ju Gate at the front of the temple and then back, which took about 20 minutes. Once we had returned to the pagoda it was then time for the traditional morning Buddhist meal, known as Balwoo-gongyang. I was extremely glad to back into the warm and once inside everyone sat along the edges of the dining area crossed legged, in the half lotus position, awaiting their rice and vegetables. We were given four bowls all of which fitted into each other. The largest bowl was for rice and the others were for soup, side dishes and water. Performed in silence, the entire process is highly ritualized. Everything must be eaten so that nothing is left, not even a grain of rice and the bowls must be cleaned with water which is then drunk, as nothing must be wasted. Once the meal is completed, everything is reassembled to as it was when first received and the chopsticks must be placed back in their cover, on top of the bowls along with the towl. After the meal was the tea ceremony, which also gave us the opportunity to talk to Grandmaster Seol Jeog Un. Originally introduced from China, it is not as formal the one I experienced in Japan and also acts a means for Buddhist monks to reflect upon themselves, nature and the universe. Sitting in a semi-circle around Grandmaster Seol Jeog Un, it proved to be very interesting and informative and I was surprised at how relaxed and open he was to everyone's questions. He told us of how he was trained in traditional martial arts under the tutorage of the Venerable Yang-ik and that he attained enlightenment in 1975, at the Beomeosa Temple in Busan. We also learned from him how he had first built a road and started renovating the temple during the 1980s, up until the present day. He also talked in depth about Buddhism in South Korea and how he enjoyed having people on the Temple stay programme, as it gave people the opportunity to learn more about the Buddhist way of life and Korean culture. Just before it was time to go, we had the additional bonus of being able to watch a martial arts demonstration from different schools around Korea, who were visiting for the weekend. It was extremely enjoyable to see and I even had the opportunity to join in and practise the traditional Korean martial art of taekwondo, which helped provide a perfect end to the weekend. This proved to to be great fun, despite the language barrier and hopefully before my time here is over, I'll get to try it out again before I return to Britain in March. Did I leave feeling more fulfilled and a step closer to enlightenment? Maybe not, but I left with a greater understanding of a religion I knew little about beforehand, as well as some wonderful memories, not to mention some extremely sore legs.